On Monday, January 12, 2015, the San Antonio Spurs were invited to the White House by President Barack Obama for a ceremony in the East Room honoring the team’s 2014 NBA Championship. 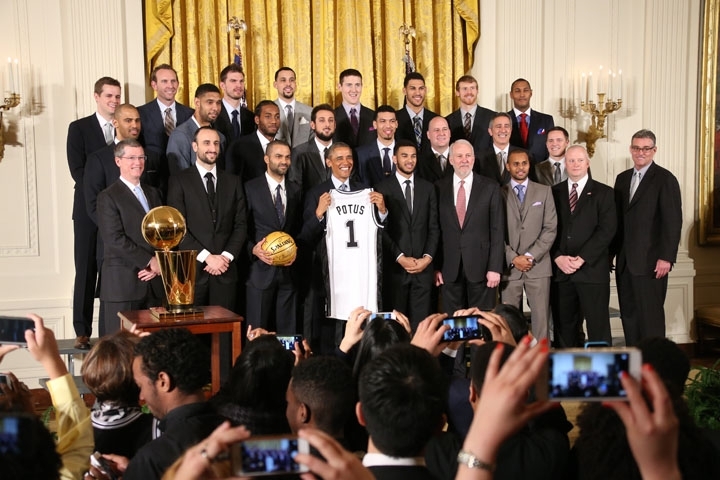 This is the fifth White House ceremony for the Spurs as an organization spanning 15 years and three U.S. presidents. Head coach Gregg Popovich and power forward Tim Duncan, having been in those roles for all five championships, have now participated in ceremonies hosted by Bill Clinton, George W. Bush, and Barack Obama. This was President Obama’s first time honoring the Spurs and he used the opportunity to praise the team’s ability to help players succeed, stating that “they find folks who didn’t have a chance someplace else and suddenly they figure out a way to make them shine as part of a team. And in that sense, they’re a great metaphor for what America should be all about.” President Obama also spoke about the role the Spurs have played in globalizing NBA basketball as well as their commitment to selfless team play. He observed that, “this is an international team. It’s the U.N. of basketball teams. And it shows the way that this wonderful sport has become an international sport. Some people have, rightfully, started calling it — the Spur’s style of basketball “the beautiful game.” And when you look at the passing and guys back-cutting the hoop and sharing the basketball, you see basketball the way it should be played. And I was telling these guys you can now see everybody around the league actually stealing, first of all, assistant coaches who then become coaches and then start applying that style of play all around the league. And it’s made the game better.” You can watch the video of the entire White House ceremony below.